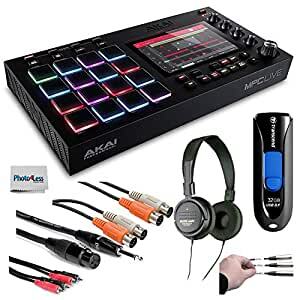 Akai Professional MPC Live Standalone MPC + Audio-Technica Stereo Headphones + Transcend 32GB JetFlash USB + Cables + Peel-Off Labels + Cleaning Cloth – Deluxe Music Bundle! Akai Professional MPC LIVE PORTABLE STANDALONE POWERHOUSE 7â high-resolution multi-touch display Internal, rechargeable lithium-ion battery. This Akai MPC Live Standalone Music Production Workstation is an ideal addition to any studio set up while also being versatile enough to be used on stage during live performances. This sampler & sequencer combination from Akai provides everything required to start making fully formed tracks from scratch. Additionally, the intuitive operation and hands-on approach to music creation means it is always great fun when building music from samples or other instruments.